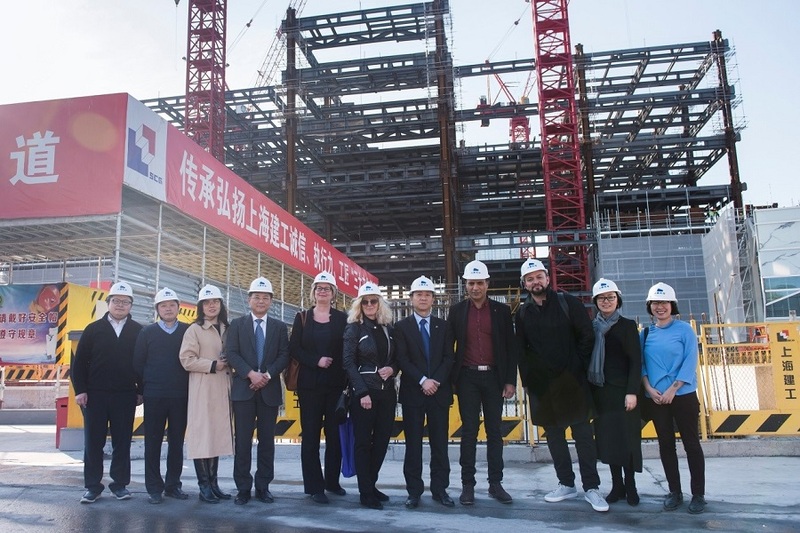 A delegation from Denmark’s Aarhus City visited the construction site of Shanghai Library East on the afternoon of March 19. Delegation members included Aarhus Vice Mayor Rabih Azad-Ahmad, Culture and Citizens' Service General Manager Kirsten Jørgensen, Dokk1 Library Director Marie Oestergaard, and staff of Danish design company SHL. Their visit got a warm reception by Shanghai Library Director Chen Chao, Deputy Director He Yi and other library staff. DOKK1 covers an area of 28,000 square meters, while Shanghai Library East is four times bigger. How to manage and operate it? Has the post-utilization of the spaces been considered? What kind of team can support such a big library? All these questions were answered by Director Chen. A lot of flexible designs have been adopted by Shanghai Library East in consideration of the post-utilization and development, Chen said. The officials of Shanghai Library is now thinking about how to enhance the ability of its librarians to build a well-structured team for Shanghai Library East, as the core of management lies in the people, Chen added. Oestergaard said she hoped to have further cooperation and exchanges with Shanghai Library, and was very willing to provide suggestions on the building and operation of Shanghai Library East. After the discussion, Chen and He accompanied the Danish guests to check the progress of the construction of Shanghai Library East. Aarhus, the second largest port city in Denmark, has gained its fame in the global library industry by its iconic landmark — the DOKK1 public library. The designer of the library is SHL, also the designer of Shanghai Library East, which was called DOKK1’s “sister library” by the delegation. The delegation and staff of Shanghai Library discussed various topics related with the two libraries, including the site selection, design, exterior materials and spacing. SHL demonstrated the core design concept of Shanghai Library East — intelligence, innovation and inclusive, leaving a deep impression to the guests from Denmark.